The average American spends 93 percent of their time either indoors or in an enclosed vehicle. Doesn’t that statistic just make you want to… get outside and breathe in some fresh air? Taking a walk in a local nature spot or even the park would be a good start. But have you ever considered going camping alone? Most of us have been camping at some point, but most of the time, we go camping as a family or with friends. The thought of huddling around the campfire alone or bunking down in a tent for one doesn’t tend to have the same appeal. But there’s something special about camping solo. You’re forced to try new things and face your fears and, as a result, you’ll most likely learn more about yourself. It might sound scary, but it could turn out to be the best thing you ever did. 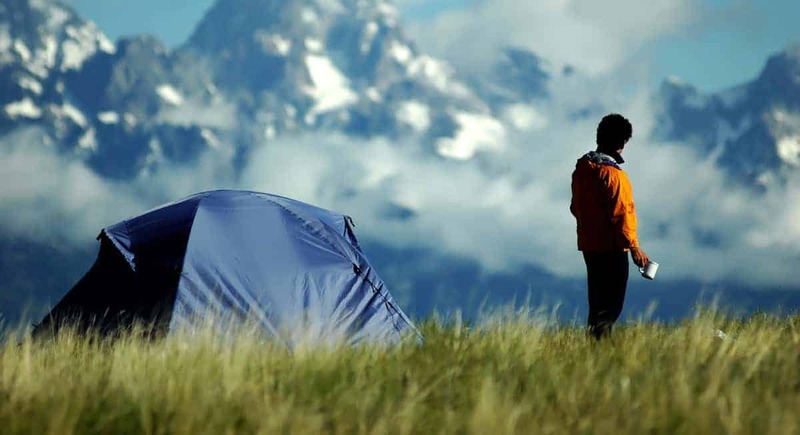 Read on to learn about the benefits of solo camping and why everyone should give it a try at least once in their lives. No calls, no TV, no emails, no children, no boss, no friends. No one and nothing to devote your time and energy to apart from yourself and your immediate surroundings. The lack of distractions might seem strange at first. But few of us have the time to really be alone these days. Even when we are alone, we’re often staring at a screen. In fact, the average American spends over ten hours a day doing just that. Swap those screens for the beauty of nature and take time to appreciate your own company, without distractions. Camping trips are great for your health. Getting out into the great outdoors for a couple of days gives you a chance to soak up some vitamin D and exercise, and often results in a great night’s sleep. Many studies have also shown the positive effect that nature has on our mental health. Being in nature reduces feelings of depression and anxiety, and lowers stress levels. As much as we love our family and friends, they can sometimes be a source of that stress. Camping alone gives you ample opportunity for self-reflection, and can really help you get a handle on stress in your life. All that fresh air and exercise isn’t the only part of camping that ensures you’ll sleep like a baby. Being in nature helps to re-calibrate your body’s circadian rhythm. You’ll find yourself waking up to birdsong in the warm morning light. And as the sun sets and the day draws to a close, nature will guide you into a restful sleep. The beauty of camping alone rather than as part of a group is that you can really let yourself get in sync with the rhythm of nature. You’ll be able to wake up when you want, go at your own pace and explore whatever you choose. If you give it a try, you’ll find that camping solo is the best way to be at one with nature. Whether it’s the chatter of friends and family, message notifications or the TV blaring, we rarely get many chances to enjoy peace and quiet these days. Camping alone allows you to embrace the stillness and serenity of nature without interruptions from other people talking and laughing. And there’ll be no one to complain about the mosquitoes or ask how far it is to the next stop. Instead, you’ll be left alone with your own thoughts as you experience and embrace the tranquility of nature. Without input from others, you’ll also be better able to form your own opinions and visual memories of your surroundings. And, as a result, you’ll see, hear and feel more than you’ve ever would have experienced on a group camping trip. Of course, camping solo does also mean that you have no one but yourself to rely on. You’ll also be the only one responsible for packing equipment, so make sure that your solo camping checklist has everything you need. This will include the best survival knife, a flashlight and other handy gadgets that become indispensable in the wild. But, as any camping for beginners guide will tell you, it’s not unusual to forget an item or for something to break. In these instances, it’ll be up to you to work out a solution. That could mean changing your dinner plans or fashioning a makeshift tool out of whatever you can find. Putting your resourcefulness to the test in this way really helps strengthen character. And, it can help you recognize how much you’re capable of when you try. Overcoming your self-doubts and fears also gives your self-confidence a huge boost. On previous camping trips you may have depended on others to navigate or build the fire. But when the buck stops with you, there’s no handing the map to your partner or letting your friend do all the hard work. You might not be very good, and you’ll probably make mistakes. But, when you achieve something you didn’t think you could, it will feel so much sweeter. As a result, you’ll feel more confident and be more willing to try new things in the future. Heading out on a camping trip alone may seem daunting. But it can also give you a great sense of freedom, as well as a host of mental and physical benefits. Our busy lives are often so occupied with everyday trivialities that we forget to look at the big picture and appreciate the beautiful world we live in. But, by getting away from it all and camping solo, you’re sure to return with a different perspective. And, if you’re convinced that a solo camping trip is exactly what you need, check out this list of cool camping gear to make sure you’re well prepared. If you are into hunting along with camping and other sports, check out the fastest crossbows for an amazing hunting experience.